You need His Lion's heart, dear man, for it takes such a heart to keep your love on. It takes such a heart to embrace another, without any thought of self. You are meant to have a love that's huge! That's wild with strength and does not get offended. And, of course, His Lion's heart would not allow you to recoil - no more shutting down and hiding. That is not for you, for His heart makes you fearless. I hear a distant sound - a roaring in the spirit. I see a vision faintly - a heart ablaze with courage. 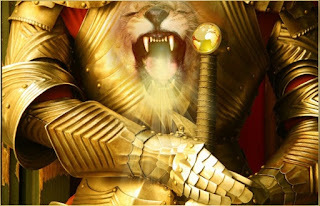 Who is this man who has been apprehended by the Lion of the Tribe of Judah? . . . He is a man who found a Lion's heart inside him.